I spent yesterday afternoon in The Hermitage in Amsterdam, a great museum, currently housing an exhibition on Peter the Great, the modernising eighteenth century Russian Tsar. The gallery space is large, well laid out, containing a wide variety of artefacts illustrating Peter’s life and the socio political world that he inhabited: his costume, his woodworking tools, painting of him in life and death, busts and descriptions of his associates and enemies, treasures he collected and ephemera that he touched. The objects, placed together, form a jumble: it’s the role of the curators to give it meaning, to find the narrative, a coherent script. Like any story, the tale of Peter the Great can be told in many ways: we have the luxury of hindsight and the ability to interpret the artefacts as we choose, supported by the evidence and other contemporary accounts. There is no single ‘truth‘, just layers of subjectivity that we build upon. The trick of curation is balance: a strong enough story to capture the interest, but enough ambiguity to reflect that there are a range of interpretations. Museums to do not present the truth: they present a truth. We create meaning every day: exploring new knowledge, interacting with our communities, sharing ideas, creating meaning. 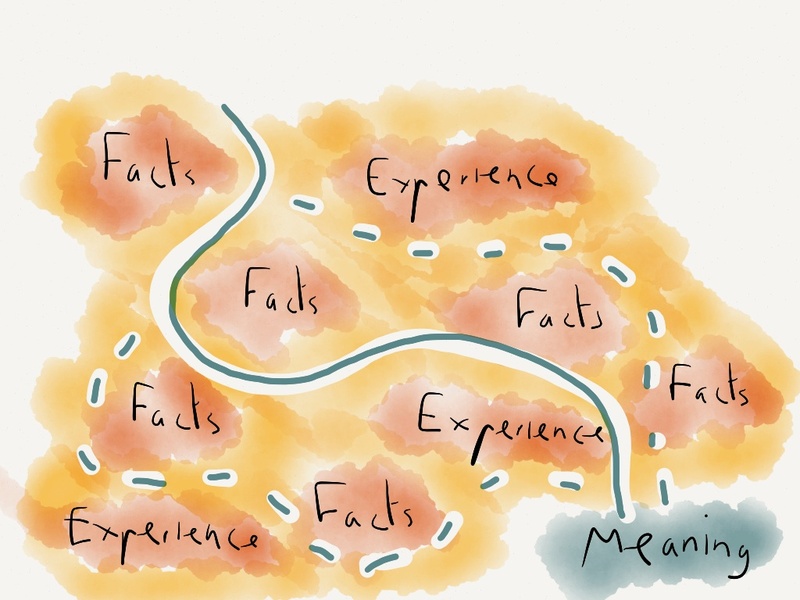 The path that we take through the knowledge is the way that we create a narrative, a view of learning that resonates within our worldview, it helps us construct our truth. But our view of the world is always subjective: we only have so much knowledge and experience on which to base it. We are always, to some extent, relying on other people’s interpretation: it’s a house built of cards. Our processes for peer review and research methodologies can give those views some validity, replicability, but our narrative of what something ‘means‘ will always be subjective and open to reinterpretation over time, which is comforting in many ways. It means that meaning will always be relevant for it’s time, an agile construct that we can use to understand things as they apply to us now. There will always be a range of views about a subject, as different people and different communities create different meanings: it’s like asking what a song is about. It means different things to different people, we each create the meaning in ourselves, in the listening. So there are multiple narratives around a subject, many different interpretations. This isn’t a bad thing to understand: they always existed, it’s just that in formal learning spaces there wasn’t always space for them. In newer social learning spaces, all of these views can be shared and discussed more easily. Social learning facilitates discussion and the co-creation of meaning. It uses the power of the community to develop and moderate our ideas, to create meaning in the moment. I’m aware that, before my visit, i knew nothing about Peter the Great. Now i know one story, an interpretation that has been fed to me by the museum. They kept enough ambiguity in the messages to allow for a range of interpretations, indeed, the final panel of the exhibition comprised two contrasting messages, that Peter was the founder of modern Russia, or that he nearly destroyed it. There is space left for me to create relevance for myself. In our own learning design, we need to consider how meaning is created: do we forge it and hand it out to people or are we engineering in the spaces and communities to allow for it to be built independently. Where are the spaces for discussion, for challenge, where are the facts and where is the conversation? This entry was posted in Agile, Collaboration, Communication, Community of Practice, Curation, Information, Interpretation, Knowledge, Learning, Meaning, Museum Education, Narrative, Personal Learning Network, Reflection, Semantics, Social Learning, Standardisation, Stories, Worldview and tagged Amsterdam, Co-creation, Curation, Interpretation, Learning, Meaning, Museums, Peter the Great, The Hermitage. Bookmark the permalink.